Pssst…. Ask any pediatrician and he’ll let you in on a little secret: babies don’t need body wash. The baby skincare market is overwrought with lavender scented, coconut infused, citrus steeped choices, which makes it seem all the more ludicrous that any mom, dad or caregiver would wash with just water. But the truth is, babies don’t get very dirty, and most baby soaps, washes and wipes are not safer or more effective than plain, lukewarm water when it comes to washing baby at bath time. An entry on the Dr. Bill and Martha Sears family advice website begins, “Most babies are over-washed.” Yes, that’s right, “over-washed.” Yet, as a dad who valued that sudsy bonding time, I couldn’t imagine a day going by when I wouldn’t run warm water, work soap into a frothy lather and wash my squiggly, squishy newborn squirt. Besides bonding, bath time also serves as an important moment when you can inspect your baby’s entire body – from the ‘soft spot’ to the cord cut to the circumcision scar (if you went that route). If you don’t want to go suds-, mousse- or bubble-free, then you should consider a biodegradable, eco-friendly wash for your papoose. There’s the homey Dr. Bronner’s Baby Mild Liquid Soap, the heavenly Weleda Calendula Baby Soap, the hip Method Squeaky Green Body Wash, the seemingly hermetic Dirty Baby Shampoo/Wash, and if you’re good with ingredients, there are various DIY recipes available online. *Important note: If you come across a baby bath care product that has disinfectant or antibacterial properties, chances are its ingredients are not baby safe. So, until your tyke starts toddling, go easy on the suds… and when you do bathe your baby, select ‘green,’ non-toxic, healthy products. Also, watch out for labels that state "tear free"- most, if not all, conventional baby products (i.e. johnson & johnson) will put in ingredients that will numb the lil' one's eyes. It is a natural reaction to get a little teary-eyed if something gets into ANYONE'S eyes- it's a form of protection that your body exhibits. And check out the line Earth Mama Angel Baby for absolutely amazing pregnancy, labor, and baby products that are 100% natural and certified organic and kosher and are phalate and bpa free. They are, by far, my favorite company to do demos for and their products are ABSOLUTELY heavenly! They definitely meet my strict standards for ingredients and biodegrade-ability. Their website, earthmamaangelbaby.com, has an amazing list of resources and support for ALL mothers (those who've gotten c-sections and even those who are mourning the loss of their babies). brilliant post! we never use anything but water or a flannel on our baby or three year old, unless there is something that cant be removed, like paint. If we have to wash their hair we use a pure castille soap. and on that note, pure almond or olive oil, for dry or flaking skin and corn starch to dry out folds is all you need for a new babies kit. truly their skin has all the oils and softness it needs, all we do is dry it our with soap and then have to put moisture back in with cremes as a result. the same is actually true for us adults! Hi mamamy, thanks for the tip on reading between the lines. I never suspected that 'tear free' actually meant 'includes eye-numbing agent'. I'll have to do some research on that. I'll save interested parties a Google search by including the link to Earth Mama Angel Baby. I bought Dr. Bronner's soap for my newborn. It irritated my skin (which is beyond sensitive - the culprit, I think, is the citric acid), so he's been bathing in water only. I also read in an article that to save skin from drying out, even older kids should only be washing areas that really get dirty, and not sudsing up their whole bodies like they tend to want to do. Makes sense, I guess. Many, many children have eczema and soap only aggravates it. Goggles in the tub work nicely for hair washing. Pssst�. 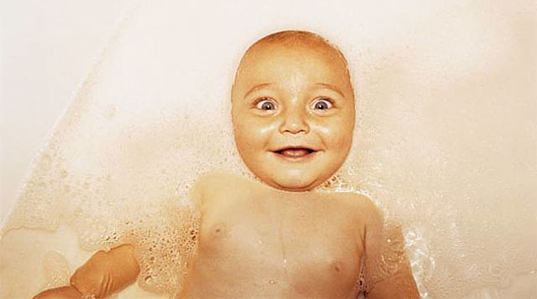 Ask any pediatrician and he�ll let you in on a little secret: babies don�t need body wash. The baby skincare market is overwrought with lavender scented, coconut infused, citrus steeped choices, which makes it seem all the more ludicrous that any mom, dad or caregiver would wash with just water. But the truth is, babies don�t get very dirty, and most baby soaps, washes and wipes are not safer or more effective than plain, lukewarm water when it comes to washing baby at bath time.